Schedule a weekly routine cleaning that involves sweeping, dust mopping, or vacuuming (using the bare floor setting) to remove dust and dirt. Clean spills immediately with a dry or slightly damp cloth. Use a cleaner made specifically for wood floors, like Wood Wizard. 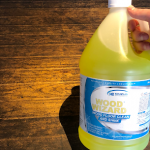 Wood Wizard is a concentrated mopping solution with a quick evaporation formula. Chemical cleaners that sit on wood floors too long, damage them and decrease the floors lifespan. Wood Wizard not only evaporates quickly, it deep cleans and renews wood finishes. Commercial Oven Cleaning Made Easy!